Their destination at high elevation is the centerpiece for this study, with two identical metal frameworks—arrays—that hold eight feeders each. Access to the feeders is regulated by RFID activated doors and the feeder arrays can be raised and lowered depending on the snow depth. The frameworks hang by cables between trees in the forest that reaches 8,300 feet above sea level. 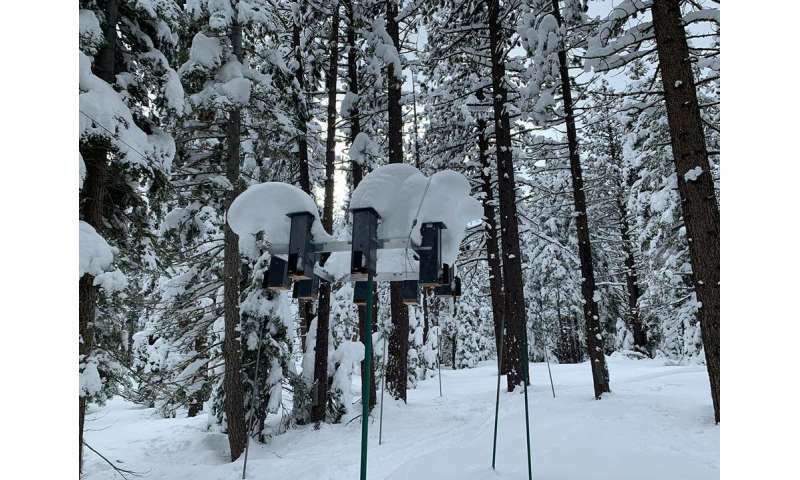 Two similar arrays are set up at their lower elevation study area about four miles away and a few thousand feet lower in elevation. "It's a simple system, we built it all in-house, with many design and build versions as we adapted them to the environment," Pravosudov said. "We collaborate with Dr. Eli Bridge from University of Oklahoma on RFID designs. Our feeders are field tested, needing to survive the elements and other animals—squirrels when the snow is deep, and bears all the time—who are looking to steal the bird seed from the experiment feeders. Bears have destroyed many feeders before we figured out how to avoid them." The field lab at high elevation is the centerpiece for this study, with two identical metal frameworks - arrays - that hold eight feeders each. 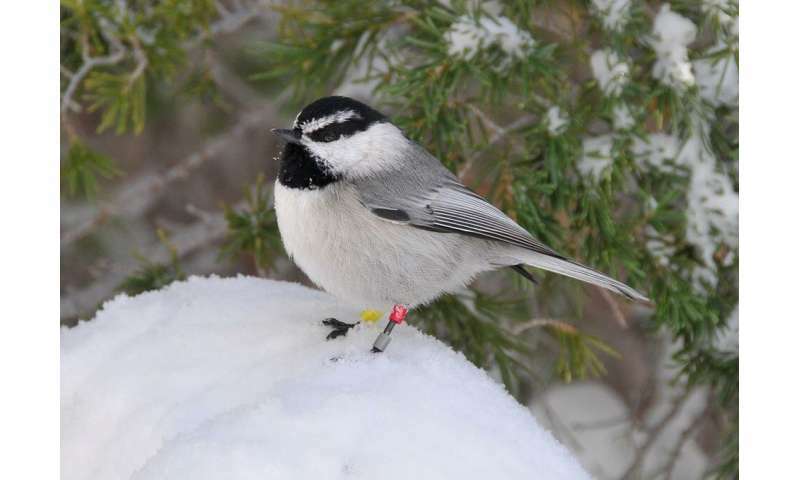 Access to the feeders is regulated by RFID activated doors and the feeder arrays can be raised and lowered depending on the snow depth. Credit: Vladimir Pravosudov, University of Nevada, Ren.